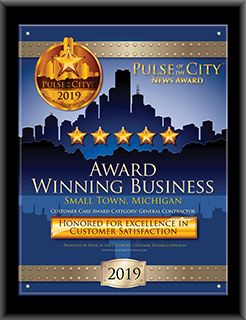 The Pulse of the City News rating system measures customer satisfaction in the building and construction industry based on research conducted during the past six years. It is more than a snapshot of “what did they do last?” Our process separates the reality from the smoke and noise to which many other rating systems succumb. The award reflects countless hours of research from thousands of customer reviews from multiple sources searched in an effort to provide vital information to our readers who are building owners, procurement directors, key estimators and project team leaders in the building and construction industry. And now this valuable recognition is available to you and your business. Click on the links below to see how you can benefit from our research.